Freedom to control our time should lie at the heart of any struggle. We have been ruled for years by archaic economic ideas, particularly the claim that a healthy dose of economic austerity is the best way to get the economy’s engines firing again. It is a zombie idea, discredited almost nine decades ago when Herbert Hoover insisted on balancing the budget during a crisis, and sent the economy into a tailspin. If bad ideas are not allowed to die, good ideas slip into obscurity. Today, one of those buried ideas is enjoying a well-deserved revival: basic income—the idea that every citizen is entitled to an income sufficient to cover basic needs. New assessments of basic income have cropped up in The New York Times, The New Yorker, The Wall Street Journal. It seems to be one of the few radical reform ideas that appeal to people on both ends of the political spectrum: The Koch brothers’ favorite think tank, the Cato Institute, has revisited the idea, and former SEIU head, Andy Stern, has written a book about it. Historically, market luminaries such as Friedrich Hayek, Milton Friedman, and Charles Murray have given rhetorical support to the idea because of their hostility to welfare-state programs (they hope to replace them with a basic income, though a punitively small one). Tech entrepreneurs have embraced basic income in anticipation of new waves of technological unemployment from robots and artificial intelligence. Those of us on the left, however, have a different vision of what basic income might achieve. A group of European intellectuals and activists created the Basic Income European Network-BIEN (later to become the Basic Income Earth Network) in 1986, dedicated to promoting universal guaranteed-income policies. Working tirelessly over 30 years, they have won endorsements for the basic income idea by trade unions, community groups, and political parties. Since the 2008 Global Financial Crisis, support has exploded in Europe. Recently, 64 percent of respondents in a European wide poll said they would vote in favor of creating a basic income. One unexpected result of BIEN’s efforts was that political leaders in many middle-income countries such as Brazil, India, Mexico, and South Africa embraced the idea of basic income as a way of dealing with popular unrest. Across the globe, governments began to enact direct income supports to their poorest citizens. While none of these schemes amounts to a full basic-income system, cash transfers to the poor have proven to be a powerful weapon in reducing poverty. Perhaps as many as a billion people in the developing world are now receiving these cash transfers and the idea has been endorsed by the World Bank and powerful global charities. Studies have definitively shown that there is no truth to the right wing claims that giving poor people money demoralizes them; it does the opposite. Moreover, providing everyone with a basic income is an obvious way to make societies more resilient in the face of global climate change and it would slow the flow of refugees from economic hardship. In the United States, no matter how appealing basic income is, advocates face the problem of sticker shock. Implementing a generous basic income would require raising much more revenue through the tax system. This, of course, threatens the regrettable bipartisan consensus that there must be no increase in the tax burden on middle-income households. But, like other societies, we do not have to get to a basic income in one giant leap. An intermediate step would be to significantly transform the existing Earned Income Tax Credit into a full negative income tax that provided subsistence income to all poor households. (With a negative income tax, poor households receive a monthly or weekly check from the government rather than transferring funds to the government through tax withholding.) Because such a program is highly targeted, it could eliminate poverty completely for a net cost of $250 to $300 billion—much of which could be raised by establishing a financial transaction tax. Even this interim step would represent a big break from the mix of poor relief and social insurance on which Western nations have relied. But it would also be a step toward something more radical: decoupling money and work by giving money to everyone. For centuries, arrangements for poor relief have been shaped by the principle of “less eligibility.” The phrase was used by the English Poor Law Commissioners in 1834, and meant simply that people who depended on the notorious workhouses for public assistance must always suffer more than those workers who were not on public assistance. This same principle molds our social assistance policies to this day. Note that as real wages have fallen over the past decades, so too have the benefit levels of our contemporary poor-relief system, known as TANF or Temporary Assistance to Needy Families. The conditions of receiving even this meager stipend have become more arduous and more insulting, requiring that people submit to innumerable bureaucratic routines that teach the lesson that wage work, any wage work, is preferable to the dole. Simply put, wage work has become one of the most elemental pillars of our civic religion. It is not just an American religion, although Americans tend to be especially fierce devotees, but virtually a world religion. Remember the myth of the Garden of Eden, shared by all the Abrahamic creeds, Christian and Muslim and Jewish traditions alike. Once upon a time, the story goes, God was generous. He created Adam and Eve and gave them a garden of plenty in which to live. But although there were many trees with many fruits, they were tempted by the serpent and disobeyed God’s warning not to bite into the fruit of the tree of knowledge of good and evil. For this sin they were cast out of the garden and made to struggle for their subsistence. They had sinned, and so ever after they were made to work for their livelihood. Work is our punishment, the story goes, and our redemption. The myth explained the harsh reality of life for people who struggled over the millennia to survive in a subsistence economy. But the myth was also put to the service of dominant groups who wrested control of the fields, the forests, and the streams on which subsistence depended and then blamed the ensuing poverty on the poor themselves. Over time, many of the world’s people were not only cursed by the need to work; they also had to work for those who controlled the resources that turned labor into subsistence. They became workers for hire by the propertied, and the drudgery and the abuses of wage work now became the fate to which humankind was consigned for the sin in the Garden of Eden. Religious myth was not sufficient to ensure docility. People still rebelled. They took to the road as beggars or vagabonds; they escaped employment and joined the king’s army; they poached small game on the master’s land; or they simply starved or became ill and died on the steps of the homes of the better-off. And as markets in labor began to supplant arrangements that relied on law and tradition, as well as sheer destitution, to enforce work, the problem of regulating work grew. In response, an institutional arrangement was gradually devised in the late Middle Ages to enforce wage work. The institution came to be called poor relief. But there will also be popular resistance. 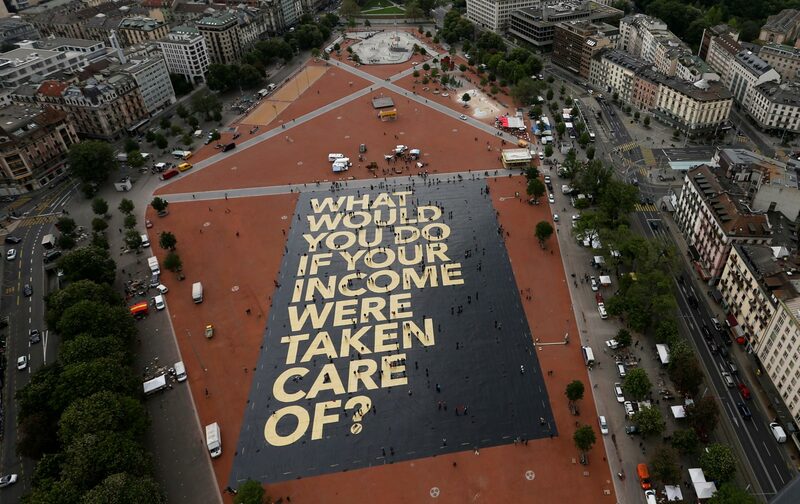 In June, a Swiss referendum resulted in only 23 percent support for a nationwide basic income. This skepticism was not unique to that prosperous and fairly conservative nation. Basic income will generate resistance because of practical matters, like a rise in taxes. But even if those challenges are overcome, the reform will confront resistance because of the cultural upset it will generate. There will be deeper fears in play, not easily assuaged by wonkish arguments showing how the bills can be paid. Could it be that people are afraid of being freed from wage work, even from a portion of wage work? What would they do with their newfound free time? Watch television or play with their iPhone? A shorter work week, or no work week would make a rich leisure life possible, and it would make a dense social life possible. There would be time to invest in our communities, and time to care for one another, and especially to care for the young, the old, and the sick. But if the patterns of that leisure, the elements of that community, have become invisible to us, well, maybe everyone might as well go to work for whatever camaraderie the workplace provides. These fears are another reason that the debate over basic income has such extraordinary political potential. It is not just another reform; it is a proposal that makes us think about what it is we are here on earth to do. Both our civic religion and harsh economic necessity dictates that we must work in order to live—how else are we going to pay off those student loans? But when a tiny population of farmers can feed many millions and highly automated factories can churn out more cars and more consumer goods than people can afford to buy, what is the point of the tyranny of wage labor? And what precisely is the justification for the huge gap between the ostentatious wealth of the billionaires and the misery of those who can find only the most degraded forms of work? Basic income raises the big questions—what is an economy for, and why can’t we have one that serves the needs of everyone?